The Giant of Boston. Photo by Weeklydig. Click to view large. Last week, a small show by everyone’s favorite set of identical twin graffiti artists opened at the ICA Boston. The show is not the massive, playful and immersive installation you might expect from Os Gemeos, rather it is a much more traditional show in a white-walled room. I went to Boston hoping for an installation to rival their museum shows in Brazil or at least comparable to their 2008 show at Deitch Projects. But, in its own way, a white-walled show makes sense. 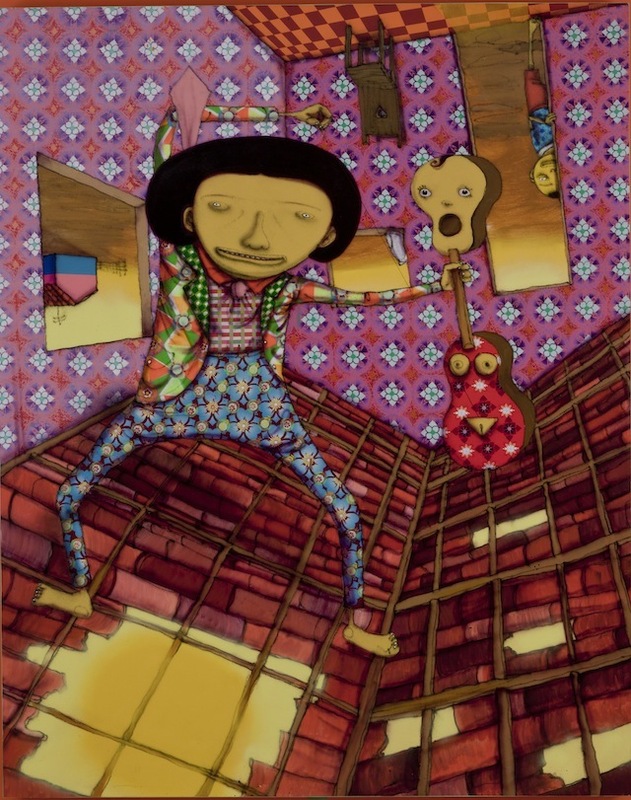 Curator Pedro Alonzo described the show as an attempt to show that Os Gemeos’ work could hold up in a traditional museum setting with just a few paintings being hung on walls and plenty of space between each picture. 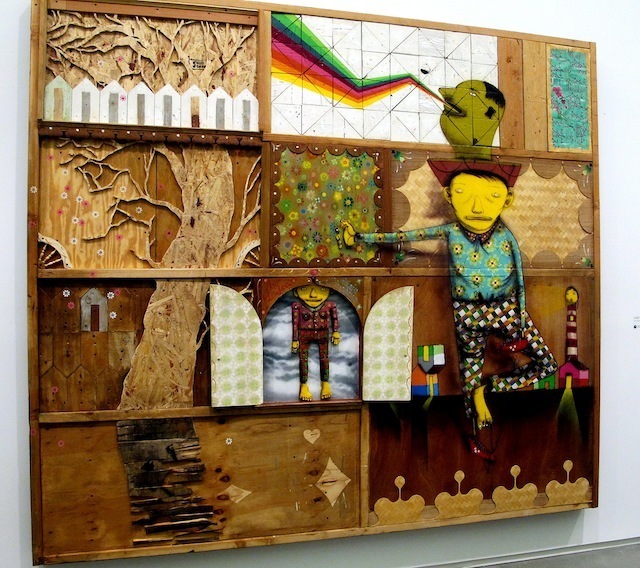 Another person suggested to me that hanging a white-walled show is a way to prove that Os Gemeos’ work will continue to be interesting long after the twins are dead and no longer make new installations. I think they are right, but I just wished that Os Gemeos picked another time to prove themselves, perhaps a time when I wasn’t taking six hours of buses to see their show. So I went into the show with expectations that could never be met, but I did find something else there. 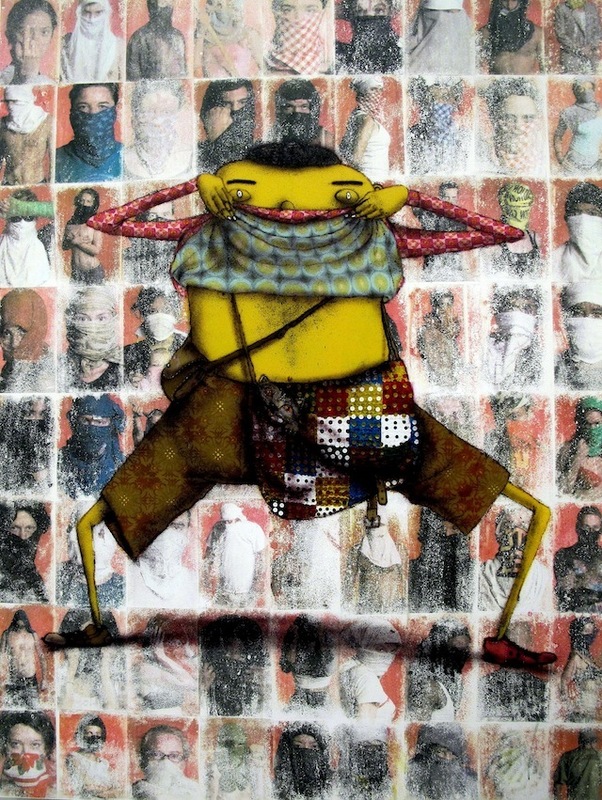 Alonzo’s bet has been proven right: As hundreds or perhaps thousands of collectors around the world already knew, now the world too knows that an Os Gemeos painting may look great when put into one of their installations, but it can be absolutely brilliant just hung on a wall by itself too. The two weakest pieces in the show are actually both pieces that are just the sort that might shine as components in an installation. One was made for Viva la Revolución: A Dialogue with the Urban Landscape, a show at the Museum of Contemporary Art San Diego also curated by Pedro Alonzo. The story that Alonzo told about the piece turned out to be a lot more interesting than the work itself. The twins were in San Diego prepping for the show when they saw a bunch of tablesaws and similar tools that aren’t as widely available in Brazil, and they were inspired to use material that would have otherwise been discarded (including bits leftover from Swoon’s installation) to make something. Only problem is, the result of their recycling just doesn’t look like much alone on a white wall and without the story. Upside Down Sunrise. Photo courtesy of the ICA Boston. Thankfully, most of the paintings work well in a traditional gallery, and a few are absolutely brilliant. In particular, I practically couldn’t look away from Upside Down Sunrise and an untitled painting of vandals on the New York subway tracks (which happens to be owned by Lance Armstrong). For any graffiti nerds out there, it is probably worth seeing the show just to see how many names you can recognized painted into the subway piece. 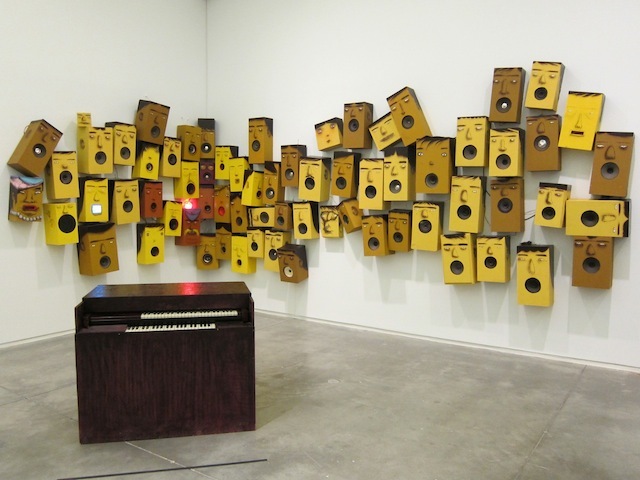 Of course, there’s also the sound installation, a corner of the gallery filled with brown and yellow faces shouting and singing, if the right buttons are pressed on the accompanying piano. I just hope there’s someone there during the show’s run to play it, since I doubt that visitors will be allowed to. And for those of us who wanted a little more, the twins did not disappoint outside. They painted two murals (and a van) in Boston. The smaller of the two murals is on the Revere Hotel, and features two writers tagging the wall. It’s a great little piece to be surprised by. I think I overheard one man trying to contact the police about just what the hell was going on, but most of the people whom I saw come across the mural were loving it. Os Gemeos at the Revere Hotel. Photo by RJ Rushmore. Click to view large. 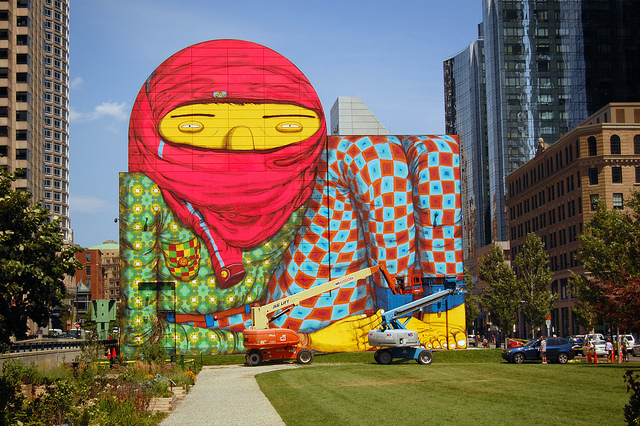 Both in scale and awesomeness, the piece on the Revere is nothing compared to The Giant of Boston, Os Gemeos’ largest mural in the United States by painted surface area, but it’s been causing a bit of controversy. The Giant of Boston is located at Dewey Square, and you really can’t miss it. 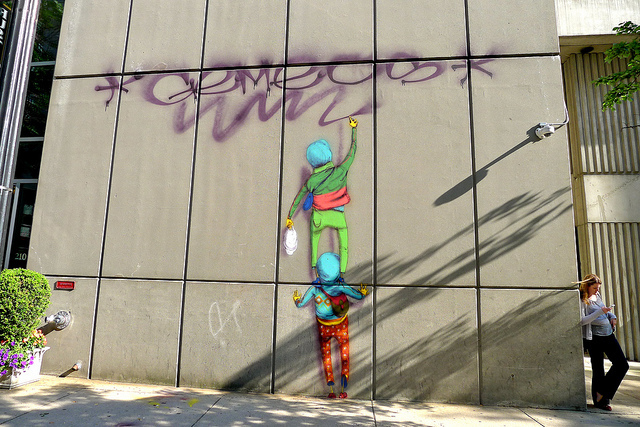 But just what it is has proven to be not very evident to people who are not already familiar with Os Gemeos. The masked is most likely a protestor or a vandal, as the twins have painted in the past, but at least hundreds of Boston residents have looked at The Giant and seen a “terrorist” or a “towel head.” A photo of the mural was posted on the Facebook page of a local Fox station, and literally hundreds of people have posted similar ignorant/racist responses. Bostinno has more on this controversy. I do not think that this show is what most Os Gemeos fans were hoping for, and it certainly wasn’t what I was hoping for, but damn it I couldn’t stop smiling the entire time I was in the gallery or looking at either of their murals. 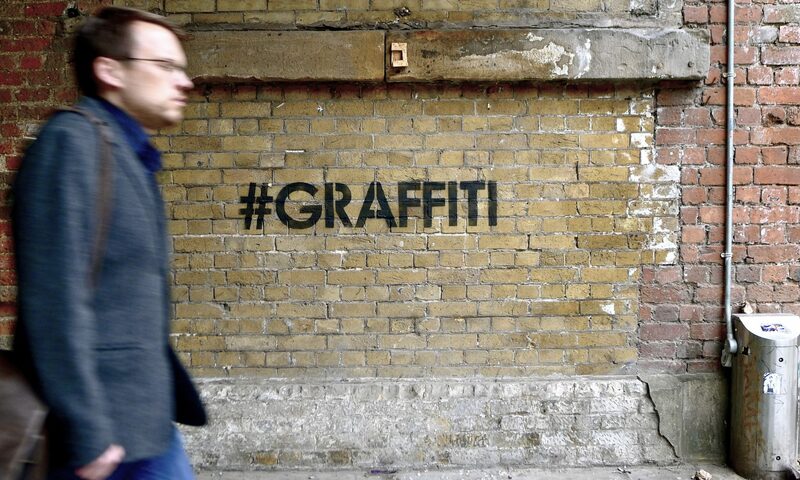 There’s some good work, and Alonzo isn’t wrong to want to show that the work can hold its own in a white-walled space or brighten up the streets of Boston. Now, I’m just hoping that both murals stay up for the full 18-months that they could potentially be around for. 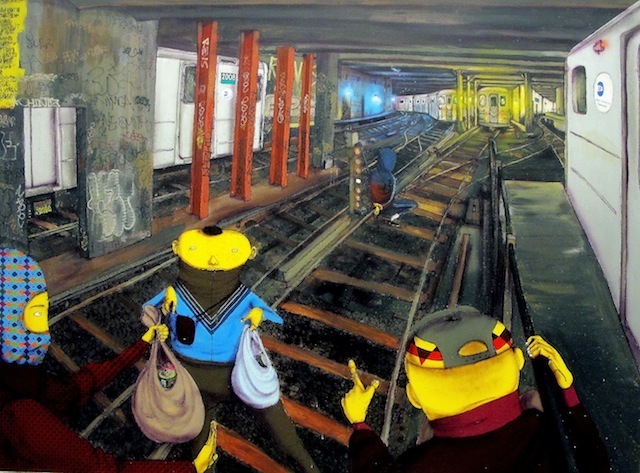 Os Gemeos’ show is open at the ICA Boston through November 25th.